Convolutional neural networks (CNNs) have been successfully used for fast and accurate estimation of dense correspondences between images in computer vision applications. However, much of their success is based on the availability of large training datasets with dense ground truth correspondences, which are only rarely available in medical applications. 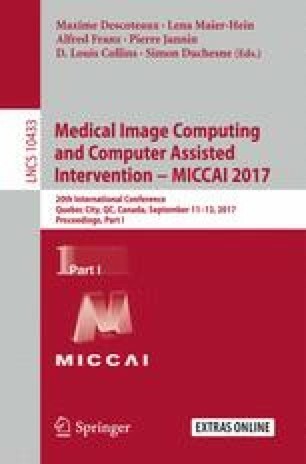 In this paper, we, therefore, address the problem of CNNs learning from few training data for medical image registration. Our contributions are threefold: (1) We present a novel approach for learning highly expressive appearance models from few training samples, (2) we show that this approach can be used to synthesize huge amounts of realistic ground truth training data for CNN-based medical image registration, and (3) we adapt the FlowNet architecture for CNN-based optical flow estimation to the medical image registration problem. This pipeline is applied to two medical data sets with less than 40 training images. We show that CNNs learned from the proposed generative model outperform those trained on random deformations or displacement fields estimated via classical image registration. H. Uzunova and M. Wilms — contributed equally to this work.